Normal and physically handicapped children should be encouraged to play together in a playground. Many parks and playgrounds are not handicap accessible and this creates a separation between them. We must increase the interaction between non handicapped children and the handicapped children and aid in creating friendships and understandings. So how do we begin to create a playground for the physically handicapped while making it user friendly for everyone else? Start by creating wheelchair ramps all around the playground equipment so the children with special needs can go where everyone else can go. Playground equipment should be universally fun for everyone regardless of their abilities. Have low level handicap monkey bars, so children in wheelchairs can reach and pull on them. The American Disabilities Act has a guideline for them to be 53″ high x 36″ wide x 10 feet long. 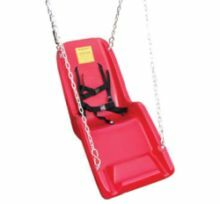 Put swings that have a wider seat with safety belts and harnesses. You can even install swings that can hook on to a manual wheelchair and swing the entire wheelchair. Handicap swings are designed for children who have trouble sitting up or balancing themselves. Such swings for handicapped children is called a JennSwing which supports the entire body of the kid. Full Support Child Swings – This swing seat comes equipped with a safety harness and backrest. Has a high back that provides more support for children with special needs. This swing is made out of a sturdy and strong plastic. 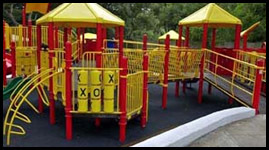 Cover the playground floors with a soft material like rubber to cushion the falls. Install railings to assist the physically handicapped children throughout the handicap playground. As the children play together, they will be more receptive to the differences in all peoples. Handicapped children will also gain more confidence in themselves through play. We must get the proper handicapped playground equipment for handicapped child. For a list of the nearest handicap accessible parks and playgrounds, visit the NCPAD and search your area.